Enter this giveaway for a chance to win a July new release worth $16. Good luck! I'd like to win a July new release because there are lots of July releases I'm looking forward to! Why would I like to win these books? That's easy! It gives me the chance to try genres that I wouldn't normally buy for myself. They're exactly the kind of books I like to read. I really want to read the Crystal Crowned. Fingers crossed that it's amazing. I love to win becausevi love to read because it makes me relaxed . I'd love to win because the books released in July look very intriguing! I'd love to win because who doesn't love winning an awesome new read?!? I can't wait for some of these July releases! I would like to win these books because I am always excited to get random books that are new reads!!! Also quick question how/where am I supposed to add the e-mail address? I have no idea where to look for my approved email addresses.. Thanks so much! I love to read and always welcome more books. Well, aside from loving books and reading and collecting them...these ones are NEW RELEASES so I'm pretty excited! I like to read new release books because I see them in the bookstore, and it makes me long to open them! I would love to win this because I need something new to read! I'd like to win a book because books are expensive and I have no income. I'd like to win because I'm finally getting back to reading after stopping for a while and there are SO many new books coming out!! They all look so yummy! Thanks for the giveaway! There are so many new releases this month that is on my TBR list!! I love to read; visiting exotic lands and meeting exciting people. There's nothing like a good book to take me away from my everyday life! I am addicted to reading! I'd love to win because the New Releases on my TBR always exceed the funds in my bank account...and a free book is ALWAYS awesome! I'd love to win this giveaway because there are so many July new releases that I'm excited about. Oh there is so many good ones coming out this month, I would love to win and pick one to read! I always will love the smell of new books. Would love to win one! Love New books and I love to read. Thank you for the giveaway. Would love to win because there are some seriously awesome releases this month and I'm on a slight book buying ban... For now... Might not last the month lol. My must have right now is The Shadow Hour <3 <3 Need that book almost as much as air lol Thank you so much for the chance!! Unless I win them, I rarely read a book so soon after release. I usually wait for the price to come down (especially when there are sales on the ebook and I can get it for $2.99 or less). So it would be nice to win to be able to read it before I can see any spoilers on blogs! I finally have some down time and would love to spend it reading! Thanks for giving. I love reading and there are some authors that I already love (like Kassie West) and some I would love to meet for the first time. I'd like to win, because I'd really love to have Harry Potter and the Cursed Child. 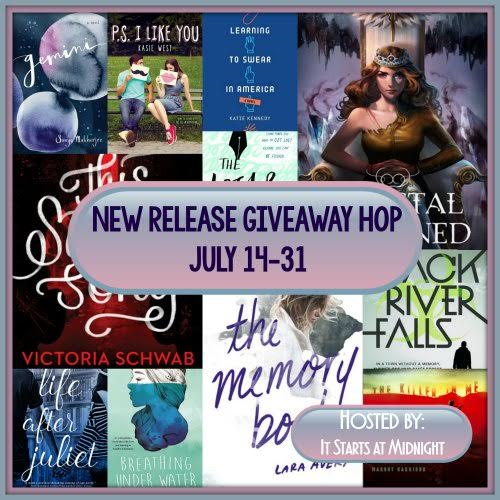 I only entered your July New Release Giveaway Hop. It would be great to win a July new release. Why would you like to win these books? I want to win a book because i enjoy reading and discovering new authors. I'd like to win so I could read P.S. I Like You by Kasie West. I love to read and there are some great releases this month! Books are the best gift! I always welcome book gift. I would love a chance to win The Waking Fire by Anthony Ryan it's on my fantasy wishlist. I'd love to win a new release in July from Katie Lane because I love her books and the current series she's on. Her books are my go-to feel good reads. I would like to win because I have been wanting to get hold of a copy of Truly Madly Guilty by Liane Moriarty. I want to win because I can never have too many books.